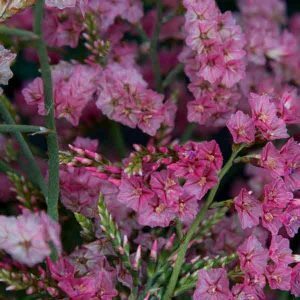 Commonly known as Statice, Limonium is actually a large genus offering the gardener and landscaper with a range of garden worthy plants. Very attractive long lasting colourful flowers on tall stems are the main attraction. The foliage is held close to the ground and rises in thick textured leaves, the flowers rise well above. These plants are mainly from the Mediterranean area, Northern Africa to southern Europe, and are very drought tolerant. The common name of Statice comes from their former botanical classification. Statice includes many varieties of perennial and annual plants. Limonium ‘Perezii Blue’ is a very popular form, reaches around 100cm in height deep purple to mauve flowers from spring to summer. Limonium Perezii Blue Seas is a popular perennial variety growing to 60cm, flowering in spring and summer, trim to prolong blooms. Limonium sinuatum or ‘Wavy leaf sea lavender’ is widely used. Limonium latifolium is commonly called ‘Sea Lavender’ and is widely used for dried cut flowers., it flowers from spring through summer. Pink Statice. (pictured right) Limonium roseum is a relatively low growing static reaching 60cm. Frost tolerant and reasonably drought tolerant once established, the rose pink flowers make great cut flowers. Does well in full sun in a well drained soil. Limonium enjoys a sheltered, sunny position,light,well-drained soils and is suitable for coastal locations. Most species are excellent for en masse background planting, cottage gardens, cut and dried flowers.